Planned Parenthood employees and other reproductive healthcare workers have faced increased threats and harassment since the Center for Medical Progress released videos claiming to show PPFA officials discussing the sale of fetal tissue for research. Good job, pro-life advocates—you have successfully contributed to making Americans less safe. The release of the videos in July, which PPFA has countered are deceptively edited, spurred five congressional investigations (with the end goal of defunding the organization) and countless condemnations of the organization from Republican politicians and aspiring politicians. Since then, specific reported incidents of harassment at PPFA facilities have become nine times as common, according to a complaint from the National Abortion Federation. 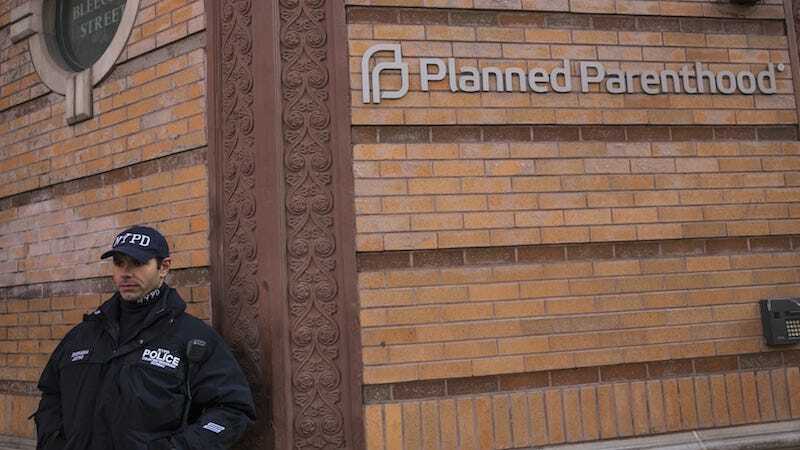 Planned Parenthood clinics in California, Washington, Louisiana and Illinois have reported arson attacks since July, and a clinic in New Hampshire was vandalized with a hatchet. The violence has led a number of clinics to install increased security, including bulletproof glass, security cameras, and metal detectors. Trespassing, vandalism, burglary and stalking are recorded far more frequently by the NAF, which builds its statistics using reports from member clinics as well as pro-choice organizations and news reports. Since 1995, there have been a total of 5,147 violent incidents recorded at US abortion clinics, not including 2015. They include 922 reported incidents of vandalism, 663 anthrax or bioterrorism threats, 354 stalking incidents and 204 reported death threats. The Guardian also reports that overall, incidents of picketing and general disruption have fallen since 2008. On Friday, Robert Dear opened fire on a PPFA clinic in Colorado Springs, Colorado, where he killed three people and wounded nine. If Dear was motivated by abortion, which it seems he was, it will be the ninth time anti-abortion activists have murdered since 1977. When Diane Horvath-Cosper, a fellow at MedStar Washington Hospital Center in D.C., saw a photo of her toddler on an anti-abortion site, she was shocked, then angry.